There are probably around 240-250 species of woodpecker in the world. They are found on all the main continents, but not in Oceania, Antartica and the Arctic. South America and South-East Asia are the two regions with the most woodpeckers. Woodpeckers include, wrynecks, piculets and flickers, in addition to the 'true' woodpeckers. Most are arboreal, but not all are as attached to wooded places as one might expect, some live in lightly wooded deserts and some are decidedly terrestrial, feeding mainly on the ground. Woodpeckers are not always easy subjects to observe and photograph, certainly not those that live in dense forests. 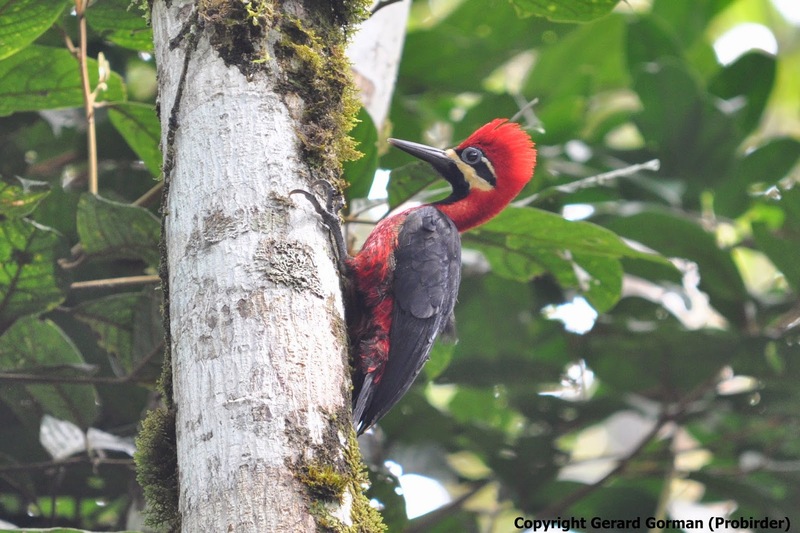 Photo of this spectacular Crimson-bellied Woodpecker Campephilus haematogaster taken in Peru by Gerard Gorman. Toucans are often favourite subjects for bird photographers in C & S America. Something to do with their impressive colourful bills perhaps ? This Keel-billed Toucan Ramphastos sulfuratus brevicarinatus was taken in Costa Rica by Gerard Gorman.